Wet and leaky basements cost homeowners untold millions of dollars every year in property and structural damage. Wet basements also pose serious health risks by allowing mold and mildew to thrive. 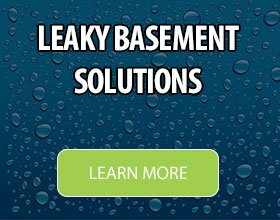 JJBY provides expert assessments and permanent solutions for your wet and leaky basement. Proper grading to direct rainwater away from your home is essential to avoid flooding. Standing water on your lawn can make it unusable and create a breeding ground for mosquitos and insects. JJBY assesses your property’s drainage issues and designs a remediation plan that will solve your problem. 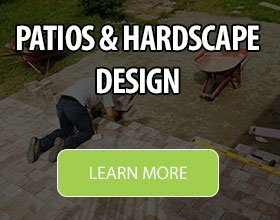 At JJBY, we have the skills, craftsmanship and experience to completely transform your property through hardscape design and installation. 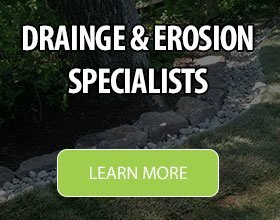 Our expert designers create stunning hardscapes that are as usable as they are beautiful, while also improving your property’s drainage. 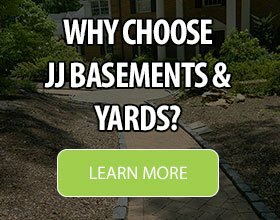 Why Choose JJ Basements & Yards? JJ Basements & Yards only goal when working with you is to identify the root of your leaky basement or drainage issues. We then share our findings and propose a solution based on our knowledge and experience. We keep it simple and our clients find our direct and honest approach refreshing. I engaged Len Blakley and JJBY to design and build a replacement retaining wall and new walk at the front of my home. The challenge here was the extremely steep slope of my front yard and driveway leaving a narrow strip across the front for the walk. Len immediately keyed on a design for a more classic look using low, wide pillars to anchor ends of the wall and worked with me to select the wall and paver materials. Within a few days, I had a new and a level walk and wall more in keeping with my colonial style home. I am very pleased with the design and installation by JJBY. The crew was always courteous and left my property clean of debris and I would heartily recommend them. I am delighted to recommend JJ Basements and Yards. I have worked over the past year with Jose Juan Celadonio and Len Blakely to correct some drainage issues in our yard as well as to repair and upgrade our unfinished basement which had some water issues. Len brought a large store of approaches and solutions to our problems, always focusing on what would be most workable, cost-effective and attractive. We really trusted his instincts and after many years of working with others far less skilled we finally have a tricky water situation solved. Len not only designed a multi-pronged water diversion and waterproofing solution, he also closely oversaw the construction and offered to come back as needed to correct any problems that arose. Jose Juan is a hard worker with an excellent and experienced crew. He got the job done promptly and with minimal mess. The crew was always careful to clean up and to leave the areas where work was done in tip top shape. I will absolutely call this team back for any additional water problems we encounter. I have already recommended them to my neighbors who have been equally satisfied. Highly recommended. Very affordable. Performed a drainage detouring project for our HOA. It was a lot of hard work and hand digging but JJBY managed to salvage our walkway so we didn’t need to replace concrete, which also meant that the walkways all looked the same when they were done. They also replaced railroad ties at window wells. Very happy overall and would recommend Len, Jose, and their crew. Ron B., Arlington, VA, Click to Read Expanded Review! We had a basement that leaked during heavy rainstorms. We needed a contractor to correctly identify the source of the leak, propose a solution and execute the job. We had a number of contractors come out to examine the problem and a couple of them proposed digging an internal trench system in the basement for more than $20,000. Only JJ Basement and Yards took the time to carefully listen to our description of the problem, discover that the issue was exterior to our house and propose alternative solutions. Once we agreed on the approach for solving the problem, the JJBY team arrived when they said they would, delivered the job in a timely manner and cleaned up after it was complete. We haven’t had water in the basement since. In the spring of 2014, we discovered an unusual problem in the back yard of our home of over 10 years in Arlington. Out of the blue, the yard became very wet and stayed that way for over a month. This issue could not be explained by winter snow melt or rain. Len was one of 3 or 4 people that came to look at the property. Len noted that it was still early in the spring and could be due to a higher water table considering the slopes of our neighbor’s lots behind ours and the fact that there is a small shallow spring box at one side of the yard. Len felt that ground water could be surfacing at the base of the slopes and an old French drain system at the back fence line was clogged and no longer functioning so water was just sitting on top of dense clay soils. Scott & Courtney H., Arlington, VA, Click to Read Expanded Review! JJ Basement & Yards focuses on solving problems, not selling products! We identify the root cause of your wet basement or property drainage issues, then create a plan to fix the problem.